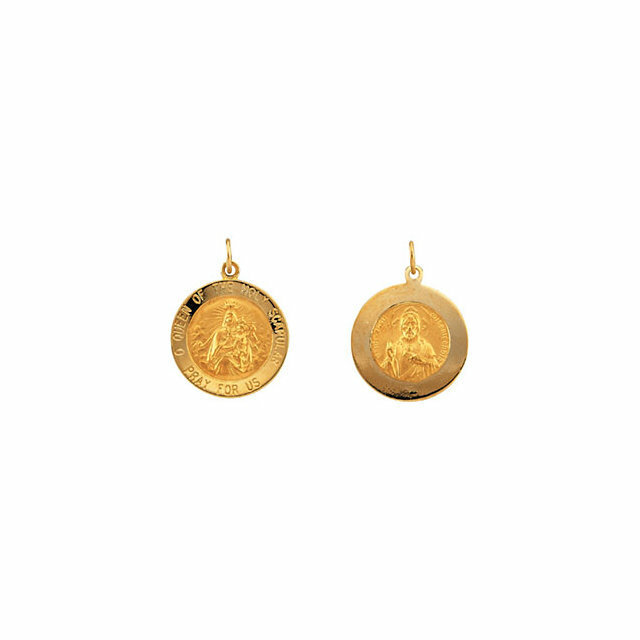 This tiny round scapular medal is made of polished 14kt yellow gold medal. 12mm diameter. This item is half the height of a quarter. Inscription reads: O QUEEN OF THE HOLY SCAPULAR MEDAL PRAY FOR US. On the back of the medal is a picture of the Sacred Heart. Weighs 0.93 grams. Please note: weight is approximate, actual weight may vary. It's a good way to wear a scapular. It's also very affordably priced. 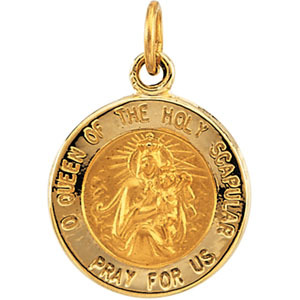 This is a very nice scapular medal and is perfect for my needs. Beautiful little medal - size perfect and price right. Prompt delivery. I wear the medal on a neck chain 24 hours a day. Do not remove it for showering. Stays beautiful. Picture did not do justice. The medal was the size I wanted!